Simple bolt on solution provides a Powerlet® outlet for many applications. Type-1 bracket is flat and designed to use existing rear-set holes in sub-frame. Provides a clean, flush appearance. 24" kits are for vehicles with mid-battery locations. 48" kits are for forward batteries. While these kits take only 20 minutes to install, they provide years of use for battery charging, heated clothing, cell phone charging and more. Three patented brackets accommodate the three common sub-frame rearset mounts including teardrop mount (Type 1 bracket), through hole mount (Type 2 bracket) and underneath mount (Type 3 bracket). The wiring harness lengths are optimized for batteries that are located under the seat. A clean installed appearance can be archived within minutes. For most installations only the seat needs to be removed. 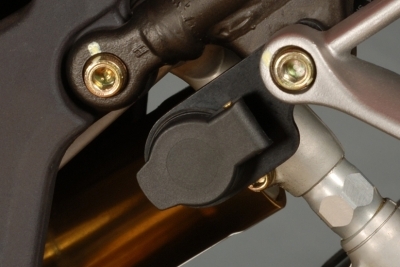 A "slip & slide" technique is used so the rearset is never removed from the bike, only loosened. This is most helpful with bikes that have exhaust hangers mounted to the rearset. Powerlet seeks the highest quality materials and craftsmanship. All of these socket kits are assembled and tested in the USA by people who like to ride. Quality components and attention to detail ensure Powerlet products resist wear and corrosion to last a lifetime.